Glaucoma is a group of eye diseases that gradually steal sight without warning. In the early stages of the disease there may be no symptoms. It is estimated that half of the people affected by glaucoma may not know that have it. Vision loss is caused by damage to the optic nerve. This nerve acts like an electric cable with over a million “wires.” The optic nerve is responsible for transmitting all visual stimuli from the eye to the visual cortex of the brain. The brain sorts out all of these electrical impulses to create what we call vision. It was once thought that high pressure within the eye is the main cause of optic nerve damage. Although elevated intraocular pressure is a risk factor, we now know that other factors must also be involved because even people with “normal” levels of pressure can experience vision loss from glaucoma. Adult Glaucoma falls into two catagories: Open Angle Glaucoma and Closed Angle Glaucoma. Primary Open Angle Glaucoma is the most common form of glaucoma affecting over 3 million Americans. It is usually bilateral. Ocular damage occurs when either excess fluid is produced within the eye and/or when the eye’s drainage canals become clogged over time. The inner eye pressure (also called intraocular pressure or IOP) rises because the correct amount of fluid can’t drain out of the eye. With Open Angle Glaucoma, the entrances to the drainage canals are clear. The clogging occurs further inside the drainage canals in a similar fashion to a clogged pipe below the drain in a sink. It is now realized that the susceptibility to optic nerve damage is different for different people and may vary in the same individual at different times in the course of the disease. Most people have no symptoms and no early warning signs of the onset of Primary Open Angle Glaucoma. If this disease is not diagnosed and treated, it can cause a gradual loss of vision. Whatever vision is lost, cannot be regained. This type of glaucoma develops slowly and sometimes without noticeable sight loss for many years. It usually responds well to medication, especially if caught early. Narrow Angle or Angle Closure Glaucoma is much more rare and is very different from Open Angle Glaucoma in that the eye pressure usually rises very quickly. This happens when the drainage canals get blocked or covered over like a sink with something over the drain. With Angle Closure Glaucoma, the iris is not as wide and open as it should be. The outer edge of the iris bunches up over the drainage canals when the pupil enlarges too much or too quickly. This can happen when entering a dark room. Treatment of Angle Closure Glaucoma usually involves surgery to remove a small portion of the outer edge of the iris. This helps unblock the drainage canals so that the extra fluid can drain. Usually surgery is successful and longlasting. Symptoms of Angle Closure Glaucoma may include headaches, eye pain, nausea, rainbows around lights at night and very blurred vision. In this type of glaucoma, the optic nerve is damaged even though the intraocular pressure is not very high. It is not known why some people’s optic nerves suffer damage even though pressure levels are in the “normal” range. Those at higher risk for this form of glaucoma are people with a family history of normal tension glaucoma, people of Japanese ancestry, and people with hypertension and a history of systemic heart disease. There is also some evidence suggesting that patients who have undergone refractive eye surgery may be at a higher risk for this type of glaucoma. Normal tension glaucoma is usually detected after a detailed examination of the optic nerve. Recent studies have concluded that eye drops used to lower intraocular pressure were effective in treating cases of Normal Tension Glaucoma. The goal is to keep normal pressures as low as possible with medicines or surgery to prevent vision loss. Although rare, Pigmentary Glaucoma tends to occur at a younger age that Primary Open Angle Glaucoma. Pigment Dispersion Syndrome occurs when pigment granules that normally adhere to the back of the iris (the colored part of the eye) flake off into the clear fluid produced in the eye. Sometimes these granules flow toward the drainage canals of the eye slowly clogging them and raising the eye pressure. This rise in eye pressure gradually causes damage to the optic nerve. If this happens, Pigmentary Dispersion Syndrome becomes Pigmentary Glaucoma. It is estimated that Pigmentary Dispersion Syndrome becomes Pigmentary Glaucoma about 30% of the time. Although Pigmentary Dispersion Syndrome appears to strike both men and women at an equal rate, researchers are investigating why men develop Pigmentary Glaucoma up to three times more often than women. The tonometer is the instrument that is used to measure the intraocular pressure (the pressure within the eye). The determination of the intraocular pressure (IOP) is the single most important feature in the diagnosis and management of glaucoma. 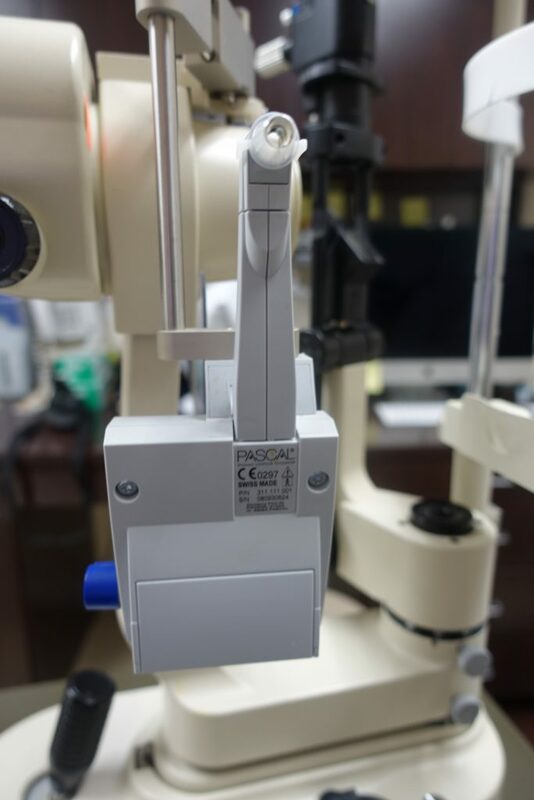 For the past 50 years, the instrument that has been considered the “gold standard” in intraocular pressure measurement is the Goldmann tonometer. When this technology was introduced in the 1950’s, the developer disclosed the limitations of this instrument, mainly that it’s accuracy was optimal with a corneal thickness of 520 microns. The Goldmann tonometer, according to it’s developer (and numerous studies), lost accuracy as corneal thickness varied from that point. The Goldmann tonometer’s shortcomings were clearly revealed in the recent Ocular Hypertensive Treatment Study (OHTS) and discussed in numerous recent ophthalmic publications. Patients who have corneas that have been altered due to keratoconus, corneal transplant surgery, LASIK, PRK and R-K surgery are particularly vulnerable to erroneous intraocular pressure measurements taken with the Goldmann tonometer. To address the shortcomings of the Goldmann tonometer, the Pascal Dynamic Contour Tonometer was developed. 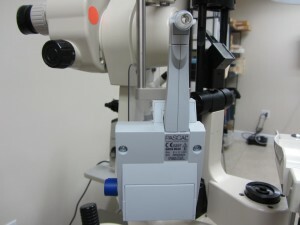 The Pascal, which recently received approval from the Food and Drug Administration for U.S. distribution, was given its name in honor of Blaise Pascal, the 17th century physicist who is known for the “Pascal Law of Pressure.” Unlike the Goldmann Tonometer and other applanation tonometers, which are influenced by corneal thickness and other characteristics of the cornea and may therefore provide incorrect measurements of the intraocular pressure, the Pascal tonometer provides an accurate, direct measurement of the true intraocular pressure which is independant of individual variations in corneal properties and biomechanics. The Pascal detects and accurately measures the dynamic fluctuations in intraocular pressure range to which the eye is subjected due to ocular blood flow. This instrument repeatedly samples intraocular pressure at the rate of 100 times per second. The Ocular Pulse Amplitude and the systemic pulse rate are also measured and recorded by the instrument. In addition, the ocular pressure pulse is graphically represented on the patient report. The Pascal tonometer measures both the diastolic and the systolic intraocular pressure. The difference between the diastolic and systolic intraocular pressures is called the Ocular Pulse Amplitude and is automatically computed. Furthermore, there is evidence that the Ocular Pulse Amplitude (a measurement of the blood flow into the eye) could play a role in the clinical course of glaucoma. In addition, the Ocular Pulse Amplitude reflects the ocular blood flow corresponding to the heart pulse as a function of time. A reduction of the blood flow may cause hypoxia and further cell death and therefore may also initiate diseases like glaucoma and possibly other circulatory problems. 1. Glaucoma is a leading cause of blindness if left untreated. 2. There is not cure for glaucoma and vision lost cannot be regained. With medication and/or surgery, it is possible to halt further vision loss. Since glaucoma is a chronic condition, it must be monitored for life. 3. Older people and African Americans are at a higher risk for glaucoma. Other risk factors include positive family history, high myopia, diabetes and systemic hypertension. Certain medications such as sleeping pills may increase your risk of developing glaucoma or of increasing the pressure within the eye. Tell you eye doctor the names and dosages of all medications that you are taking. 4. With Open Angle Glaucoma, the most common form, there are virtually no symptoms. Usually no pain is associated with increased eye pressure.